The latest Flex Duo oven also divides the door, but only when you want to. 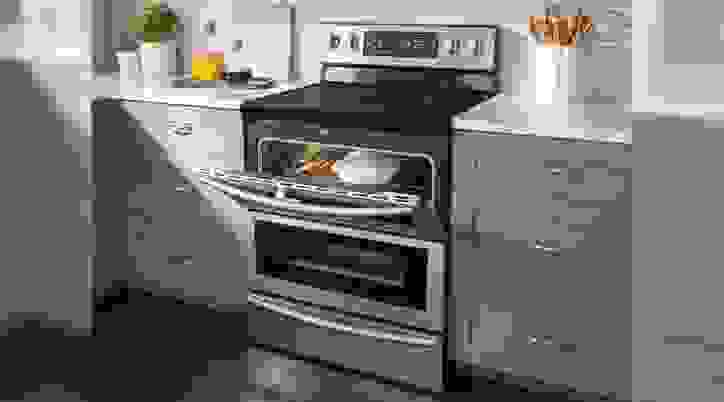 We put the Samsung NE59J7850WS Flex Duo electric range through its paces in our labs, testing the rangetop and the oven both single and divided into two. The rangetop earned high scores, but the ovens had variable results. For more information on how we test, click here. We baked two cakes side by side in the single oven using the standard setting. Results weren’t perfect, but displayed better-than-average evenness when it came to browning. The sheet of cookies we baked had light tops and dark bottoms, but each individual cookie mirrored its neighbors almost exactly. This means that lining your cookie sheet with parchment paper or turning down the temperature could solve the problem. The use of convection also resulted in cakes and cookies with light tops and burnt bottoms. When the oven was divided into two, results were disappointing. 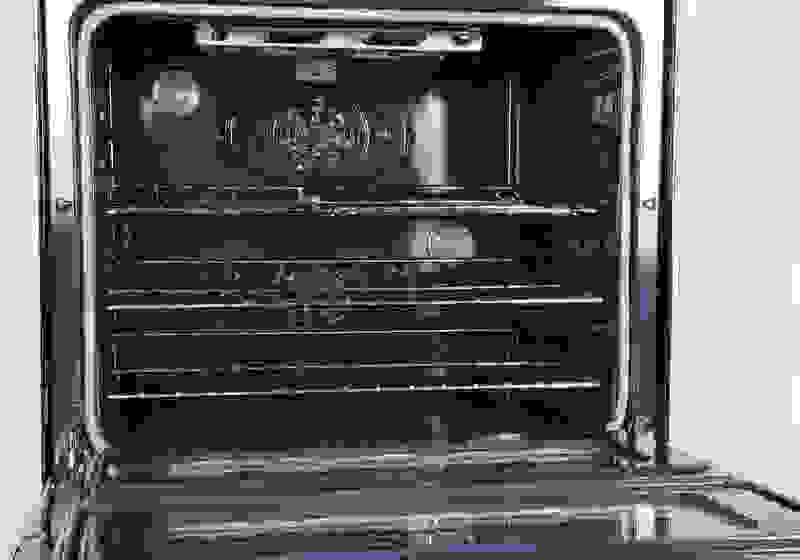 The top cavity is not able to bake without convection, but the lower cavity didn’t make a strong case for standard bake, turning out cookies with burnt bottoms and cakes dappled dark and light, burnt on various edges. Convection, however, proved a significant improvement. In the upper oven, cakes were reasonably even, despite being lighter in the middle and darker on the edges. We measured the cookies as evenly browned when we compared their tops and bottoms, but cookies on the left side of the cookie sheet were darker than those on the middle and right. The lower cavity fared about the same when we measured variation in browning. That said, everything turned out darker than on top, so keep a watchful eye on your baking. Preheats were quick for every cavity, with the single cavity taking about 10 minutes to preheat to 350°F, the lower taking about 7, and the upper taking just over 4. The upper broiler preheated in about 5 and a half minutes. The rangetop gave a well-rounded performance during testing. We measured maximum temperatures from 437°F to 629°F. The left and right rear burners led the pack at 628°F and 629°F, but the right front burner’s middle ring didn’t fall far below with a max temp of 600°F. The left front burner had the lowest minimum temperature of 96°F. The left and right rear burners dipped to 103°F and 100°F, while the right front burner’s inner ring also reached a low 100°F. Boiling times were speedy enough to satisfy. The quickest was the right front burner’s outer ring, which boiled 6 cups of water in 4 minutes 13 seconds. The left front and rear burners boiled 6 cups in 8 minutes 3 seconds and 8 minutes 2 seconds, respectively. Avoid boiling on the right rear burner, though, which took upwards of 13 minutes.